goddess saraswati is regarded as goddess of wisdom and also goddess of speech. Suitable for students who suffered from breakups in education and also suffering from maletic effects of jupiter. saraswati is goddess of knowledge, music, and the fine arts. Item Code:-KE-VS08 Desktop Religious Saraswati Yantra Its Used for Pooja Products Its Best Collection For Pooja & Religious PurposeYou Purchase and see benefit for This YantraIts Beautiful Yantra For Desktop Yantra.Beautiful Collectible Gift Yantra Its Best Purpose For Collectible Yantra. Saraswati Yantra is related to Lord Maa Saraswati. Lord Maa Saraswati is the Lord of Education, Knowledge, Intelligence, creativity and intellectuality. In Indian Maa Saraswati is worshiped to gain blessings of all these powers. Saraswati Yantra is a great tool to worship and appease Lord Saraswati. Leveraging over the skills of our qualified team of professionals, we are engaged in providing Saraswathi Yantra. Good for knowledge and learning. 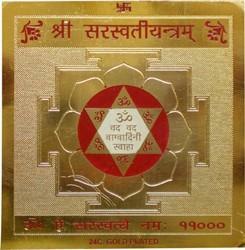 We are a prominent firm, which is involved in supplying Saraswati Yantra. Largely in demand, the offered yantra is manufactured with the aid of premium materials and machines that are installed at our vendor base. Also these yantras can be obtained in several choices.